Up from the Dust , the fifth in the Mission US series of online history games produced in collaboration with New York public television station WNET/Thirteen and game producer Electric Funstuff, was released on September 2nd. The role-playing game provides young people with an experiential understanding of the enormous hardships Americans faced during the late 1920s and early 1930s as they struggled against the joint catastrophes of the Dust Bowl and the Great Depression. The game is divided into five parts, with a prologue offering background on the settlement of the Texas panhandle and the expansion of wheat farming, and an epilogue extending the story of the main characters through World War Two. 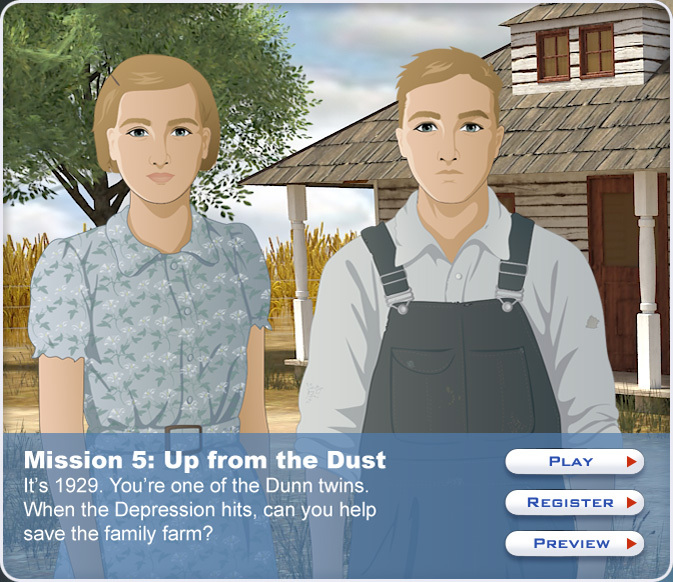 Students playing the game assume the roles of Frank and Ginny Dunn, twins growing up on their family wheat farm near Dalhart, Texas. The game begins in summer 1929 and follows family members as they confront falling wheat prices, drought, and depression. In 1932, Frank encounters nationwide desperation, political organizing, and local protests when he decides to "ride the rails" in search of work and adventure. In the meantime, Ginny tries to help her family and neighbors survive hard times, but after the massive 1935 Black Sunday dust storm she decides to join migrants heading for California. As both Frank and Ginny experience the benefits and limitations of New Deal government programs, students will understand how "ordinary people" survived this critical period in U.S. history. Deeply researched and informed by the most recent scholarship, Up from the Dust was developed for middle- and high-school students and was funded by the National Endowment for the Humanities. The Mission US series now has more than one million registered users nationwide and has garnered major awards and citations—this year alone games received the Parents' Choice Gold Award for the Best Learning Game, were a Finalist for the Games for Change Awards, and a nominee for the Daytime Emmy Awards in the Outstanding Interactive Media category. And this summer NEH awarded the series a Digital Humanities Implementation Grant to "revitalize" early Mission US games to enhance access and include features developed later in the series.